It’s a refreshingly sweet and creamy layered dessert with Lorna Doone shortbread cookie crust, fluffy cream cheese, and blueberry pie filling topped with whipped cream and crushed shortbread cookies. Delicious blueberry flavor and so luscious, you can’t go wrong with this recipe. It’s so good you’ll keep eating it! Fork please! An easy throw-together dish that includes pecans! But it’s the buttery Lorna Doone cookies (since 1912) that perfectly completes it for a delicious must-have spring or summer dessert with DREAMY texture and flavor. Use a pie filling of your choice too. Make it special with the occasion: strawberry for Mother’s Day, lemon or blackberry for the gals, peach for the office party or barbecue – a versatile recipe that always comes out a winner! 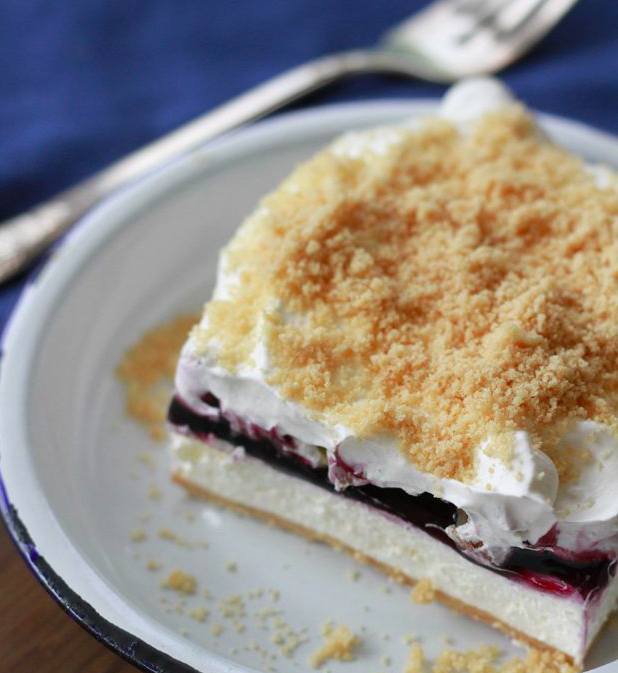 Shortbread cookie crust, fluffy cream cheese, and blueberry pie filling with whipped cream. Luscious! Preheat the oven to 350°. Crush the Lorna Doone cookies and reserve about ½ cup of the crumbs for the topping. Mix the cookie crumbs with the melted butter. Press them into the bottom of a 9×13-inch glass baking dish. Bake for 5 minutes and then cool completely. Want Another Delicious Blueberry Recipe? Now Watch How To Make Blueberry Rolls w/Cream Cheese Drizzle!